This family cabin features two bedrooms that comfortably sleeps up to six as well as a cozy fireplace to snuggle up to. 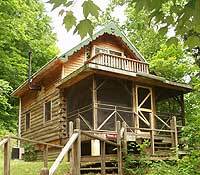 Our "Gingerbread Cabin" sleeps up to four and features a Yuletide Log Fireplace and cozy loft. Adults only. Outdoor hot tub! This cabin is for adults only. No smoking is allowed indoors, but you can smoke on the decks. Privacy on one and one half acres, 18 foot ceilings - WOW! Enjoy the silence, the class and the "lodge" feel of this beautiful cabin. Two bedrooms and a loft with two additional beds! 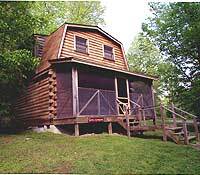 Our guests LOVE this cabin! 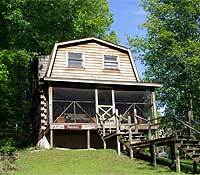 Located "off campus", this cabin sleeps eight and is within walking distance to Patoka Lake. This cabin is pet friendly. Cozy and serene is what you will find at Woods View. Woods View is the newest addition to our White Oaks family. 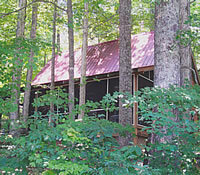 Beautifully decorated, this cabin accommodates up to four people. Sip your morning coffee on the large screened-in porch overlooking the woods. Relax and enjoy...you will love Woods View. 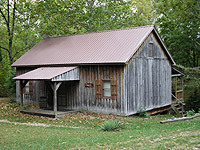 Located "off campus", this cabin sleeps four. No smoking is allowed indoors. This house is pet friendly (2 dog maximum).